Another book from The Ink Room. Finally had the time to read and review it. 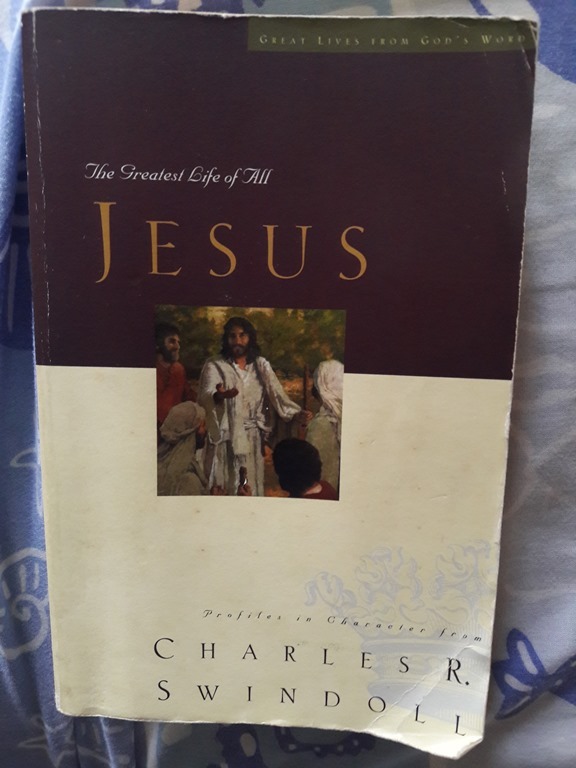 A fantastic biography and analysis on the life of Lord Jesus! He went around healing the sick, creating miracles and forgiving sins. Surely, mere human being has no authority to forgive sins. It is up to us to either accept or reject His claim. We cannot stay on the fence by saying He is an important historical figure or good moral teacher. Lord Jesus was born miraculously in the power of the Holy Spirit. Mary, His mother, willingly offered her body to bring the Messiah into the world. She had to endure shame: how could a virgin conceive? Joseph, His adoptive father, willingly took Mary as his wife to protect her from public scorn. Lord Jesus merely laid aside His divine attributes when He was born in a manger. He was the rightful heir to the throne, yet He entered into the world in a stable. It was His humble entrance into the world, in the presence of shepherds who were social outcasts. Through the person of Jesus, the kingdom of God and humanity finds representative. Different people responded to Lord Jesus in various ways. Simeon, an elderly worshiper in the Temple, recognized baby Jesus as the Messiah. The magi came and worshiped Him, presenting gifts. Herod tried to murder Him. When He was 12, his parents looked for Him all over the place though they could have found Him immediately in the house of God. When He was 30, He was ready to start a ministry. John the baptist was first hesitant to baptize Him. Yet, Lord Jesus wanted to make baptism a door way to a new kind of life. He called Peter to follow Him. Peter did and that was the start of his life calling. Lord Jesus first had to face temptation in the dessert. First was the the temptation to turn stone into bread. Basically it is to test whether someone trusts God in basic needs. Second was the temptation to jump from the pinnacle of the Temple. However, to require God to prove His promise is the positive proof one does not trust Him. The third temptation was the offer of the splendor of the world if Lord Jesus would worship the devil. However, Lord Jesus overcame the temptation of material possession. He then taught the multitudes of abundant life in Him. He is not against us having money. He is against money having us. After all, from the eternal perspective, material possession is insignificant. The abundant life He offers starts with being born again of the Spirit. This abundant life is the life above guilt, worry and shame. It is the life to please God and not men. It is the life full of faith in the face of impossibility. It is the life full of contentment from God alone. In Lord Jesus’ time, the Pharisees twisted God’s law. Their favorite is the law concerning Sabbath. Originally, Sabbath was a day where humans can rest and enjoy time with God. However, the Pharisees made it so burdensome by creating a list of prohibited works. Lord Jesus rebuked them. Since He is the Lord of the Sabbath, He took the Sabbath back from them. -exchange of religious legalism with lifelong rest of the soul. -invitation to learn how He forgives, ministers and connects to the Father. -invitation to reject slavery to religiosity, wealth and anything else which burdens us that we may become slave to Him (and that is the true freedom). During the Creation week, there was always concluding remark on the first until the sixth day when God created. However, on the seventh day, God ceased from all His work. There was no concluding remark. His Sabbath remains open even until today. And He invites all of us to enter into His Sabbath rest. It means we believe in His promise because He cares for us. Rejecting His invitation means we rely on our strength. Since our strength is limited, this spells trouble. When God created the universe, He placed certain laws of nature. He rarely uses miracle. However, when He does use it, it is to divinely validate certain events. In Lord Jesus’ time, engineers and architects utilized tricks to generate the appearance of miracles, such as turning water into wine. They did it for monetary gain. Lord Jesus, on the other hand, created miracle out of compassion. He displayed power over the trivial, distance, time, forces of nature, insufficiency and even death that we may believe that He is the Son of God. When Lord Jesus lived as regular human, He healed the sick. He empowered His disciples to do the same. As we can read in the New Testament, the divine healing is always instantaneous, permanent, obvious and free of charge. This is in stark contrast with modern day faith healers whose motivation is solely money and not compassion. It is not God’s will that every sickness be healed. Apostle James taught that when a person is sick, the elders of the church should pray and anoint him/her with oil. This was the therapeutic oil. Modern day equivalent for that is to pray and seek medical help. God may or may not heal us of our disease here. Even if He does heal us, we will eventually face death one day. Nevertheless, He promises us eternity with Him. That is the ultimate healing He offers. One parable that is very close to the heart of the Jews is the parable of the vine. In the Old Testament, God called Israel His vineyard. However, no matter how much God cared for the Israel, they did not give him the fruits (which was justice and righteousness) due to Him. Lord Jesus came to take the place of Israel. He is now the Vine of the LORD. Lord Jesus invited the believers to abide in Him. As a branch receives nutrient from the vine and naturally produces fruits, the believers should abide in Christ, receive His life and produce the fruits of Christlikeness. Apart from Christ the vine, the believers cannot do anything to produce these fruits. Lord Jesus did not come to please the majority. He came to declare the truth. This truth offended many around Him, clearly dividing who was for or against Him. Firstly, He proclaimed the truth to the crowd. They wanted Him to be the Messiah who would set them free from Roman empire. Yet, He refused as what they truly needed was a Savior to rescue from them from sin. Secondly, He rebuked the Pharisees for their hypocrisy as they nullified the law of God for the sake of their tradition. He also drove the merchants out from the Temple of God as they committed corruption and lies even in the Temple of God. Lord Jesus called the Pharisees hypocrites for they like to show off their dedication to God and to teach people to follow God. Yet, their heart is far away from God. Like Lord Jesus, there are times believers have to stand for the truth fearlessly. At first, we should use kind approach. If it does not work, we must be bold to proclaim the truth. We may have to sacrifice in doing so. Nevertheless, God will reward our boldness, if not in this life, then in heaven. Judas Iscariot wanted nothing less than Jews’ independence from Roman empire. He eagerly wanted Lord Jesus to rise to the throne. After all, the people wanted to make Him a king. However, Lord Jesus chased away the multitude. In addition, He explained that Messiah would suffer and die. Disappointed, Judas secretly plotted to betray Him. Throughout his discipleship under Lord Jesus, Judas lived a double life. On the outside, he appeared trustworthy enough as a treasurer of the group. In the inside, he stole the money. In fact, his plan to betray the Master even allowed the devil to enter him. A few lessons we can learn from the life of Judas Iscariot. Association with godly people doesn’t guarantee that we will be godly. Secret sin is deadly and it effectively twists our moral value. We must confess and repent from any secret sin. In total, Lord Jesus experienced 6 court room trials: 3 Jewish and 3 Roman trials. All of them were unfair trials even under Jewish and Roman regulation back then. In the first 3 Jewish trials, for example, the council of Sanhedrin was supposed to argue for acquittal. However, they violated their own rules by pressing their case against Lord Jesus. After all, Lord Jesus went against the corruption of the high priest. At first, they could not charge Him based on His teaching. Even the supposed witnesses did not give consistent testimony. Finally, they found a charge against Lord Jesus which was His claim to be the Messiah. This is a flawed charge. His Messiah-ship does not come with insurrection against Rome. However, in Jewish mind, a Messiah is also a leader of revolution against Rome. Similar to Lord Jesus, we must be prepared to suffer injustice in this fallen world though we have stood for the truth. Our Heavenly Father will vindicate us in His time. The last 3 Roman trials Lord Jesus experienced revolved around 4 figures. Pontius Pilate became the procurator of Judea through trickery. He ignored the truth for the sake of his political ambition. When he faced Lord Jesus, he realized He was not guilty at all. He attempted his best to deliver Him from death penalty. He really thought the mob would prefer Lord Jesus to a criminal such as Barabbas. However, when the mob pressurizing him politically, he gave in. He would rather keep political power than the truth. Some people are like Pilate. They acknowledged the truth but they traded it for power or money or relationship or comfort. He did not even bother to seek the truth of His case. Some people are like Herod. All they want to enjoy life’s pleasure without wanting to know the truth at all. Pilate’s wife was superstitious woman. She had a dream about Lord Jesus and she wanted Pilate to stay away from him. Some people are like her. They accepted the truth of Christ along with any other truth or philosophy. However, this is just superficial belief that does not transform the character. The worst group of all was the mob. They completely opposed the truth. Similarly, some people reject the truth and try to suppress it. Crucifixion is the cruellest death sentence ever invented. The Roman soldiers reserved the punishment for the runaway slaves, deserting soldiers, freedom fighters and the worst criminals. In fact, they were so skilled in controlling the amount of suffering or when the victims would die. Lord Jesus endured the lashing by the soldiers and he was not able to carry the cross on His own. The soldiers ordered Simon of Cyrene to carry it for Him. At Golgotha (Place of the Skull), the soldiers stripped Him naked to heighten the shame. They then nailed His wrists and foot on the cross. He now had to cope with 2 sources of unendurable pain: from His hands and His legs. Hanging on the cross caused the shoulders to feel dislocated. He then support to place His weight on His nailed legs. Eventually the leg muscle cramped. In addition, He had difficulty in breathing as He could inhale but was powerless to exhale. This process was repeated over and over. At last, Lord Jesus said the word "Tetelestai! ", meaning He had paid the debt of sin in full. As He died, the ground beneath the cross cracked and the soldier exclaimed "Truly this was the Son of God!" Let’s imagine how Barabbas must have felt at this time. By right, he was the one condemned to death. Yet, Lord Jesus took his place. In his right mind, Barabbas would not have said, "No, thanks. I would rather suffer agony on the cross." Similarly, we are all like Barabbas as we have transgressed against the commandment of God. We deserve death, yet He took the penalty of our sin. Surely no one will ever reject this sacrifice of Lord Jesus. As it was nearing Sabbath period, the soldiers had to hasten the death of the victims. They broke the legs of the two criminals, causing massive blood loss. However, they did not break His legs as He had already died. The women quickly prepared for His burial in the tomb. For some others, even after the crucifixion, the religious leaders were still worried about the issue of resurrection. They placed soldiers to guard the tomb as they wanted to prevent the disciples from stealing the body. However, on the third day, earthquake came and the angels came to the tomb. The large stone at the entrance of the tomb was rolled away and the soldiers fled. Angels told the resurrection to the women who were about to anoint the body of Jesus. And at last, Lord Jesus appeared to disciples. A particular attention was on Thomas. He doubted the resurrection of Christ. While it is easy to criticize him, we should understand from his perspective. He was disappointed deeply when he saw the cross. Yet, he did not want to be disappointed for the second time when he heard the rumor of resurrection. In the end, Lord Jesus appeared to him and healed his disappointment. The resurrection of Lord Jesus signifies the victory over death, darkness and demons. Two disciples, one of whom is Cleopas, did not witness the resurrection of Christ. As they went to Emmaus, they were feeling dejected and disappointed. They had been hoping Lord Jesus to be their Messiah. In the end, He died. The disillusioned disciples tried to make sense why their expectation of Messiah came to a tragic end. Suddenly, Lord Jesus joined them as a stranger but they did not recognize Him. Lord Jesus spoke with them and helped them overcome their disappointment. Firstly, they were disappointed because they could only see the issue from human perspective, not from divine perspective. Secondly, their own agenda determined their expectation. Thirdly, they failed to acknowledge the resurrection. First, we have to view life from God’s eyes. Second, we have to surrender our expectation to God and exchange it with God’s plan. Third, we we acknowledge resurrection and stake our future upon it. Peter was a self-driven, passionate, outspoken person. However, his relied on self too much. His passion proved a failure as he denied Lord Jesus under pressure. As he waited for Lord Jesus in Galilee, he went back to his old occupation as a fisherman. It was a night of fruitless toil. Yet, Lord Jesus created a miracle by giving them a large catch of fish. He then asked Peter if he loved Him with agape love. The same thing with the second question. In the third question, the Lord asked him if he loved Him with phileo love. Through these questions, Peter came to admit that his self reliance to passion is inadequate. At this point, Peter was a broken man. Yet, Lord Jesus restored him and entrusted to him the responsibility to shepherd His sheep. Lord Jesus was not looking for perfection. He was looking for a willing vessel thought it was a broken vessel. For a moment, Peter was distracted and asked what would happen to John. Yet, Lord Jesus emphasized that as he followed Him, the sheep would follow him. In the first meeting at Galilee, Lord Jesus tasked His disciples to make disciples of all nations. He is very intense with the Great Commission, though He is relaxed about the method, depending on each one’s energy and creativity. At the second meeting at Judea, He gave them His power through the Holy Spirit. The presence of the Spirit in the believers’ lives proves that they are legitimate citizens of God’s kingdom and they are co-regents with the King. With that empowerment, all believers are to be witnesses for Christ in Jerusalem (family, friends, neighbors) , Judea (country), Samaria (cross cultural, different faith and races) and to the ends of the earth. In Great Commission, while God does not need our help to accomplish His plan, He does want us and invite us in this great enterprise. The Lord has His eyes on the entire world. We can participate in fulfilling the Great Commission through praying for the missionaries, supporting them financially or even going for mission trip. As a church, we must not be too comfortable inside the 4 walls that we forget to win the lost. Though Lord Jesus ascended to heaven, His prediction came to pass. Roman government defiled the temple and took much money from the temple treasury. The Jews then rebelled against Rome. In AD 70, however, the Roman soldiers broke through the walls of Jerusalem. Fortunately, most of His disciples had fled to Antioch. With His prediction of fall of Jerusalem came to pass, we now notice His other predictions of war among the nations and finally His promise of the second return. What is His second coming like? He will physically, not figuratively, appear in the clouds accompanied by an angel’s loud voice and trumpet blast. Those who are dead in Christ will rise first, then all believers will wear glorified body (body which never falls sick or dies). Then, all believers will meet the Lord in the air. We may grieve now over the death of loved ones. However, death is just temporary separation as long as our loved ones die in Christ. God created the world originally as a good world. 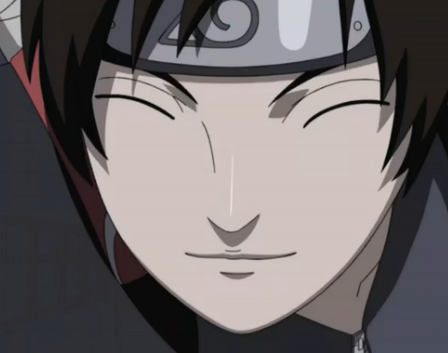 No evil existed. Due to the sin of Adam and Eve, evil came in and twisted every good God had made. When Lord Jesus returns, He will come again in power and judgment. He will rid the world of evil and restore the original good creation of God. He will come as the king of the whole world. For those who reject the grace of God in Christ Jesus, they will go to the place of eternal torment. Hence, if you have not accepted Christ, wouldn’t you consider accepting Him? Stop trying to change the universe to work the way you think it should. Grief is essentially the process of adjusting your mind to accept a radically new situation. The sooner you accept that you will not get your way, the sooner you will heal. When you give up wishing things were different, you will start to change within. Let go of those resentment. Release your grip on what you want, no matter how good or right you think it is. As you surrender your expectation, ask the Lord to show you His plan. Ask Him to open your eyes to the future He desires, and determine to join Him in whatever He has chosen to do. Transformation is a slow and sometimes tedious process. A book which The Ink Room brought in during Heroes of Faith campaign. Didn’t immediately purchase this book until 2 years ago. 5 books at 50% off. Good deal, isn’t it? 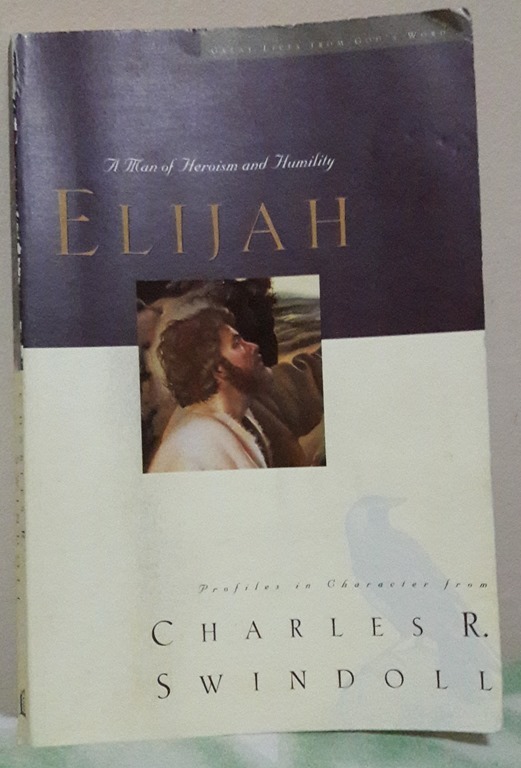 Charles Swindoll presented this book as a Bible study on the life of Elijah. Since it is going to be difficult to summarize the whole book, I will just highlight the points I find interesting. Ahab was wicked king, more evil than the previous kings of the northern kingdom of Israel. He married Jezebel who introduced pagan/Baal worship to the kingdom. At this darkest hour, Elijah the prophet came and announced God’s judgment: there would be no rain until Elijah said so. – Elijah stood alone in proclaiming God’s judgment on the wicked monarch. Similarly, even if we have to stand alone today, we must make a stand and proclaim what is right and what is wrong according the God’s word. Perhaps the best way to teach a stubborn king is by letting him experience God’s judgment himself instead of repeatedly warning him. God sent Elijah to the brook of Cherith for 2 reasons: protection and training. Elijah learned to depend on God daily ad the birds brought him food. Through the solitude, he built his prayer life. However, one day the book dried up. His lifeline disappeared due to his own prayer that there should be no rain. – There are times we should pull back from the busyness of life and be alone with God in prayer. – There are times we feel the stream of God’s blessing dries up even though we have carried out God’s commandment. We need to remember that God has the right to give and withhold blessing. He knows what He is doing for our best interest. As He does that, He removes pride, fear, resentment and carnal habit. After initial training time of isolation and meditation in Cherith, Elijah had an advanced training in Zarephath. It was a dangerous journey from Cherith to Zarephath as he was a wanted man. Nevertheless, God protected him. The widow made the last meal for her and her son before they would die. Even then, Elijah requested that last meal with the promise the oil and flour would not run our. Despite her bewilderment, widow complied with his request as his faith rubbed on her. As a reward, the oil and the flour did not run out throughout the drought period. The widow did not have all she wanted. Nevertheless, she had all she needed to survive. – God’s training never stops. When we think we are done with one training, He will bring us into another more intense training to remove more impurities in our lives. Due to all the pain, we may think God has forgotten us. However, the truth is He never leaves us and He knows what He is doing. – We need to trust God’s promise and obey His word. This is the key to unlock miracle in the midst of impossibility. – We should always thank the Lord. We may not have all we want, but He definitely provides all we need. One day, the widow’s son fell sick and eventually died. She was in deep grief and blamed Elijah for the tragedy even though Elijah helped her much. Elijah, on the other hand, was silent. He did not rebuke her. He did exactly like the Lord commanded but He still received the brunt of the blame. Elijah brought the dead body oh the son to God. He could not find any precedence of resurrection in the Scripture he read. Nevertheless, since he had faced much impossibility and miracle before, he asked God to do the impossible: to resurrect the son. After some time, God granted Elijah’s prayer and resurrected the boy. Elijah presented the living boy to the widow. He did not claim credit to such miracle. As such, the widow saw the Lord in Elijah’s life. – Bad things still happen even though we obey the Lord. In such time, we can come before God in private and ask God. – We can always bring any dead circumstance to the Lord for Him to resurrect it. – After experiencing miracle, we need to give glory to God to whom all glory is due. One day Elijah went to meet Ahab. Right from the start, Ahab blamed Elijah for all the trouble of drought. However, Elijah did not back down. He blamed Ahab as he worshiped idols. Elijah had idea of showdown between prophets of Baal+Asherah and himself. God who answered by lightning is the true God. He first asked the audience, children of Israel whether they wanted to follow the LORD or Baal. The prophets of Baal started first. They danced around, screamed and even mutilated themselves. Yet, no one paid attention. Elijah came forward and prepared the altar of the Lord. He prayed and the Lord sent lightning to burn the offering. Elijah then killed the prophets of Baal. – When we are in the will of God, we are invincible. – Divided allegiance is as wrong as idolatry. – Our most effective tool is the prayer of faith. Just as God had kept His word that there would be no rain, He kept His promise of sending rain to earth. There are times when we need to wait for the fulfilment of His promise. We even think He has forgotten it. In truth, He still remembers. God does not clarify His timetable with us as we won’t agree with Him anyway. God sent drought. He first did not tell Elijah when the drought would end. Why did He delay? Because He wanted to show the Israelites that prophets of Baal had no credential at all. Hence, Elijah could easily command the people to kill those prophets later on. Even when God did not tell Elijah the timing of drought, he did not complain as he believed God would keep His promise. We need to be careful in claiming God’s promise. Some of His promises are only applicable on the specific context in the past. Some are applicable to us today which we can claim. Even for those promises we can claim, some are conditional and we need to keep our side of bargain before God moves. Elijah claimed the promise of rain from God when he prayed on top of mount of Carmel. 7 times he prayed for rain. God sent a sign of small cloud. Eventually, the rain did come. – Elijah was a man of prayer. We, too, should pray even after experiencing victory. – Elijah prayed specifically for rain. We, too, should be specific in our prayer. – Elijah prayed 7 times. We, too, should be persistent in our prayer. God did not mind showing the lowest point of His people in the Bible. Moses, Jonah, Paul and Elijah. After a great victory, Elijah received a death threat from Jezebel. Fearing for his life, Elijah left his servant. Being alone, he went to wilderness and asked God to remove his life. He was emotionally and physically exhausted, being lost in self pity. God then allowed Elijah a time of rest and refreshment. He communicated graciously with Elijah in still small voice. He did not rebuke or shame Elijah. Instead, He clarified some facts to Elijah to get him out of self pity. He also sent a personal friend to Elijah: Elisha. – When depression or self pity strikes, we need to hear God’s voice. – We need one another in our walk with God. God never intends us to walk alone. While God is good and long suffering, there will come a point when His patience runs out. He will then carry out His justice. Ahab wanted Naboth’s vineyard. However, Naboth refused Ahab’s offer as it was against Jewish law to sell the land of inheritance. Sullen, Ahab shared the incident to Jezebel. Jezebel took matter into her own hands. She framed Naboth into his death. After he died, Ahab took the vineyard for himself. God sent Elijah to announce the doom of Ahab and Jezebel. They had provoked Him enough. – there is an end to God’s patience. No one knows it. So, we should not play games with God. Ahaziah, the son of Ahab, reigned in Israel after the death of Ahab. He was a wicked king. One day, he fell and became ill. He sent messengers to inquire Baal-Zeebub, the god of Ekron. Baal-Zeebub means lord of the flies. Such contact with demonic world will open spiritual door for demons to enter into Israel. God quickly dispatched Elijah to intercept the messengers. He told them to tell Ahaziah he would die from sickness. Ahaziah then sent soldiers to summon Elijah. Elijah refused to come with the first 2 groups of soldiers. In fact, lightning killed them. Elijah eventually came with the third group of soldiers to the king to announce his death from his illness. True enough. King Ahaziah never recovered. – we must never open door to demonic world though it may seem harmless at first, e.g. Ouija board, palm reading, astrology. God is displeased with any occult movement. Instead, God is delighted when we trust in Him completely. – we must never be afraid to proclaim God’s truth even in the presence of wicked authority. Elijah was heroic and yet humble. At this time, God was about to take him up to heaven, similar to Enoch. Because Elijah knew he was going to be taken up, he became the model of us who live in the anticipation of Christ’s return. Before he was taken up in Jordan, he went to Gilgal, Bethel and Jericho first to reflect upon his life. Gilgal was a place of beginning for the children of Israel before they entered into the Promised Land. Bethel was the place of prayer. Abraham built an altar to the LORD there. As he walked through the streets of Bethel, he remembered his communion with God in Cherith and Zarephath. Jerico was a place of battle. Elijah remembered the victory on the mount of Carmel. And finally, Jordan, a place of death. He died to self-life. He obeyed and trusted God. Throughout all this journey, Elisha followed Elijah fully. He requested that he would inherit double portion of Elijah’s spirit. Elijah was a bit taken aback. Nevertheless, Elisha did inherit double of the power. When one man/woman of God leaves this world, nothing of God stops. – Individually, we had our respective Gilgal, Bethel, Jericho and Jordan. We first started our walk by giving our heart to Him. We then learned to spend time with God. We had to conquer battles against sinful nature and temptation. Finally, we learned to die to self. – Never hesitate to ask big things from God. Yoo, another post on book review! Haven’t posted any review in a while! A book I purchased during Dec sale season. Yeah, this is another book on relationship. Not bad, I have invested a lot on this matter. Charles and Cynthia have been married for more than 50 years. Their marriage has gone from surviving to thriving. 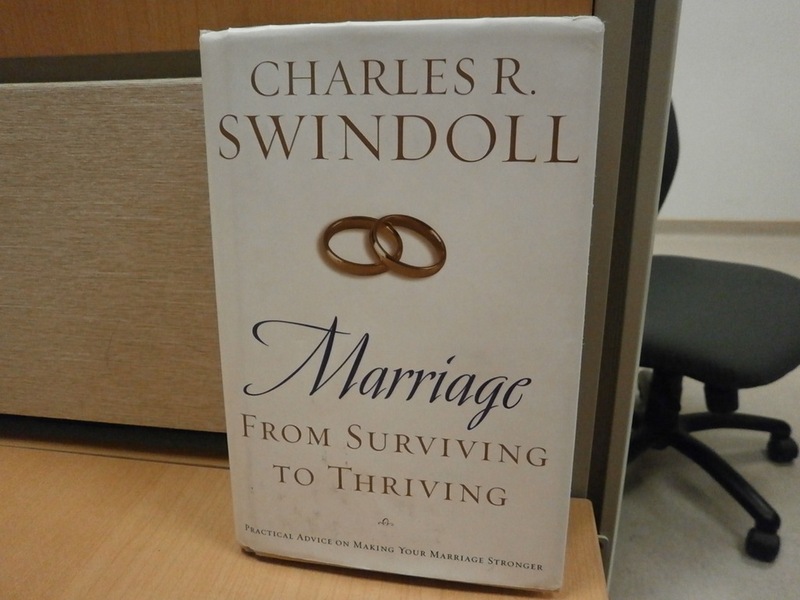 Here, Charles shares some insight on a thriving marriage. The world has changed so much that the role of husband and wife blurred. Sense of right and wrong has been weakened through continual display of lawlessness in the media. Nevertheless, there is a key to survive: our relationship with God. Let us apply our relationship with God in our marriage. Marriage is God’s idea when He created Adam and Eve. Adam was so overjoyed as Eve complimented his weakness. 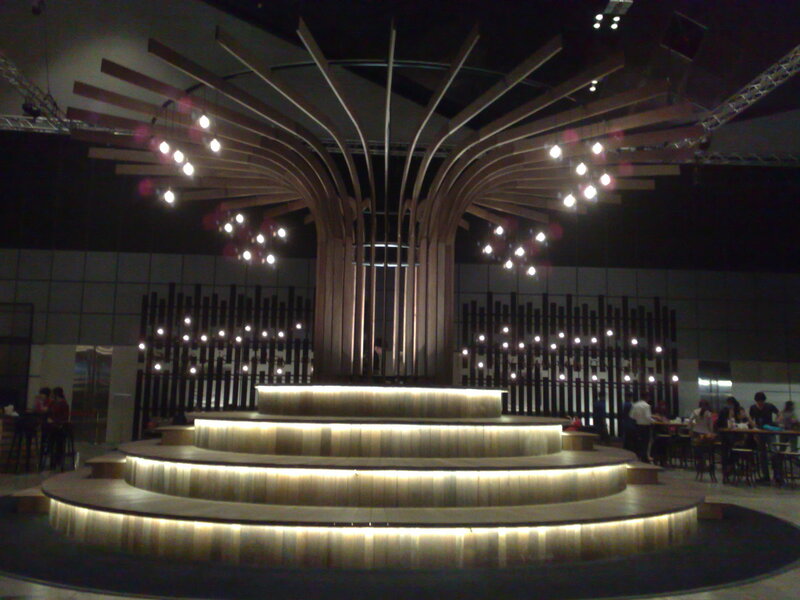 In His design, the couple should put and rely on each other more than their parents. The couple should be permanently married to each other. In God’s design, the couple do not lose their individual personality. Instead, their personality move in harmony. The couple then enjoy intimacy, which is shared joy, grief and commitment. Unfortunately, sin ruins God’s design. The couple became self conscious and self absorbed, they withdrew from each other and they ran from God. A couple lose their intimacy as they shift blame on one another. Nevertheless, they can regain it by confessing the truth and taking responsibility. The key to a permanent marriage is commitment. Commitment helps the couple last through the difficult circumstance, difficult consequence of wrong decision, or big conflict. Finally, Christ has to be in the center of marriage. express anger in a appropriate way at the right time, give to spouse what is rightfully his/hers, guard our speech, and be nice. While commitment keeps the couple side by side, love is the glue which bonds them. It is not just any kind of eros (taking) love, it should be a kind of agape (giving) love. In practice, we should write down the love action, risk it often and do it now. (8) they enjoy freedom and grace. The last 3 chapters of Ephesians provide guidelines on building a healthy family. However, as time goes by, little marital erosion may occur here and there until eventually marriage collapses. It is important for the couple to fix every little erosion to prevent its harmful accumulation. Old age doesn’t necessarily remove sense of fun from any marriage. Aging is often accompanied with sense of uselessness, self pity, fear and inappropriate remorse. However, we don’t have to succumb to those negative feelings even when we are old. We can always choose to keep exercising our mind, enjoying life, developing strength, pursuing opportunities, and seeking God. I am not sure if The Ink Room still carries this book in stock. If it does, do grab a copy of it, ok?